In just one week, voting will close on StubbyDog’s Superhero Squad selection process. Here’s some background for those of you who may not know what that is: On July 30, 2012, StubbyDog announced this new initiative which would bring together an “extraordinary crew of certified therapy dogs [who] are on a mission to win hearts and change minds.” They shared their message far and wide, inviting pit bull-type dogs from across the US to submit themselves for consideration to join this group of elite dogs. Nearly a month later, the shortlist of nominees were announced – and today, we’d like to share them all with you, and encourage you to vote for your favorites! Teams are listed in alphabetical order. 1) Big Mama Jubilee and her Sidekick, Amy, who’s not only a therapy dog with Pet Partners, but is also an awesome Frisbee dog and is working towards her first Rally Obedience Title! You can learn more about Big Mama Jubilee on her Facebook Page. 2) Bodacious and Therese. Bodacious is only one of five amazing pitties who are all registered as Therapy dogs. 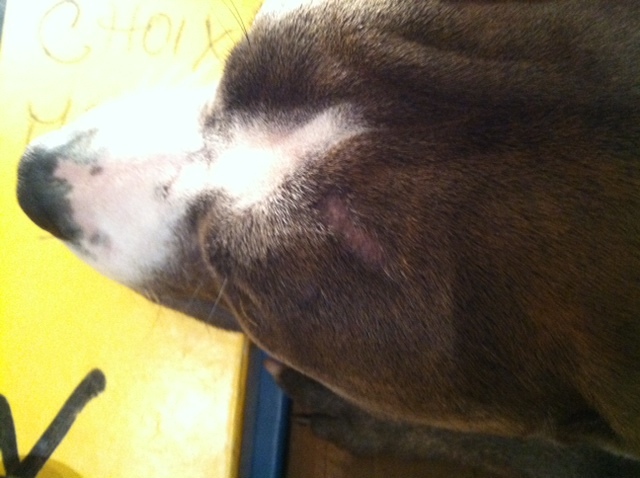 Check out the Patch O’ Pits Therapy Dogs on Facebook for more info. 3) Buddy and Barbara are the first pit bull-type therapy dog team to ever work in CHOC Children’s Hospital. Hopefully not the last! 4) Captain Cowpants and Melissa. Possibly the best name of all the Superhero nominees, Cappy (as he’s known to his close friends) is a Therapy Dog with Pet Partners, and a complete goofball. Learn more on his Facebook Page. 5) Elle and Leah are a Therapy Dog team from North Carolina. Among her therapy work, she inspired a reading-to-dogs program in her local community. You can check her our on Facebook as well. 6) Frankie, I’m a lover not a fighter and Teresa are next, and based on his video submission, he’s clearly yearning to be Super Frankie! Like him on Facebook here. 7) Gigi and Stephanie are a Therapy Dog team extraordinaire from California! 8) Jeffrey and Michele. Jeffrey was rescued from Manhattan Animal Care & Control and named after then volunteer and Adopt NY co-founder, Jeff Latzer, and is now a therapy dog through Pet Partners, too. 10) Lily and Debra. Lily specializes in therapy work involving children, including the R.E.A.D. program and weekly sessions at a pediatric therapy clinic. Read more about her story on Facebook. 11) Peaches and Emily live in Michigan and do tons therapy work through Therapy Dogs Incorporated. Read all about her on her Facebook Page. 12) Peaches and Jennifer. This second Peaches is a therapy dog through Therapy Dogs International, and her “favorite thing is to snuggle with patients in bed” at a local nursing home. Read more about the Wonder Pit on Facebook. 14) Rou and Callie. Rou’s video speaks for itself: look at how focused and calm he is with his sidekick. They make a fantastic Canine Therapy Corps team! 15) (Big) Sal and Jackie have been a Pet Partners team for 11 years, and do volunteer work and advocacy with CHAKO.org and BAD RAP. 16) Skyler and Celene have traveled across the entire country showing how wonderful pit bulls can be! 17) Stevie and Jen. Stevie the Wonder Dog hasn’t let his blindness keep him down – he’s a Pet Partners therapy dog in Utah! Learn about his work on Facebook. 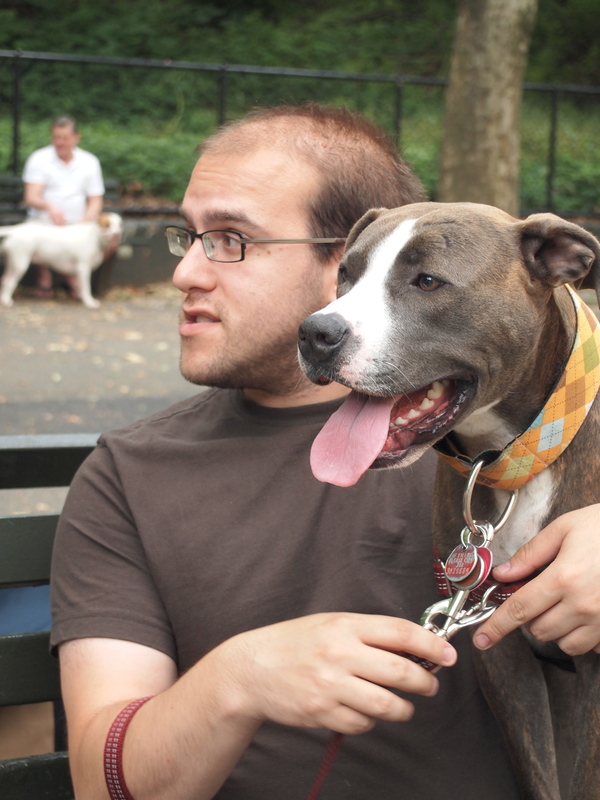 19) Touche and Therese – the second entry from the Patch O’ Pits Therapy Dogs of New Jersey. So this Labor Day weekend, get voting on who you think should be the StubbyDog Superheros! Lots of pitties and nowhere to go! Bully Project has become a victim of our own success! Classes have been fully booked and often a second class is needed. After a year of offering free, outdoor classes in the same neighborhood, we are realizing an indoor space is needed. Not only will it benefit the teams in our four-week manners classes, it will allow Bully Project to offer specialized classes such as Nosework and Frisbee. Should be easy, right? A free dog training program that benefits both dog owners and the community (training helps to keep dogs out of shelters, less dog bites, etc) should be a win/win for everyone. Churches and community groups should be lining up to partner with us, right? Nope! Please send Bully Project some good wishes…We have ONE Catholic girls high school entertaining the idea of renting the school gym to us on Sunday mornings – at a premium price, of course! If that doesn’t pan out, our last hope MIGHT be a Catholic school who plays home to two parrots, lizards and dozens and dozens of fish. The principal, who I think really wanted to be a zookeeper when he grew up, said he would approach the diocese. We welcome any ideas from readers who have faced these types of challenges. Any other ideas of space or organizations that might be willing to play host to a group of well-behaved pitties once a week? And if you’d like to contribute to Bully Project to help us cover the cost of our space rental (wherever that may be! ), you can make a donation online here. At the end of last week, my little girl Lucy shared her big news that she’s actually a Great Mini Pyramstadoodlier. But she neglected to fill you in on some of the details. That goofball. The bottom line of the test results were this: Lucy is just a big old mixed breed. 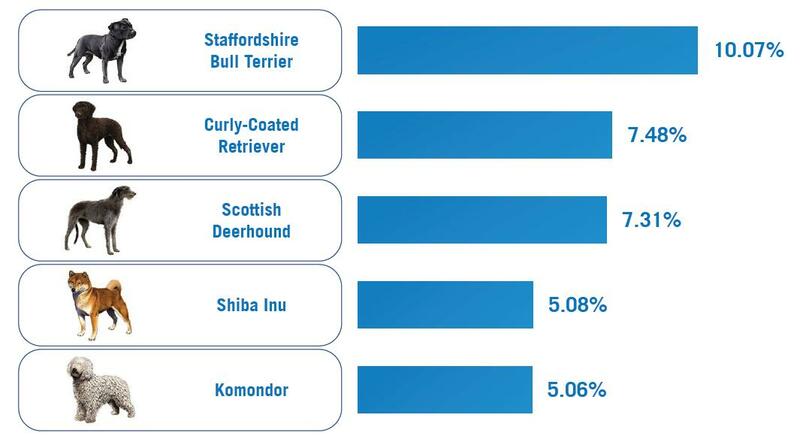 The second page of her results had further proof of this fact, showing five more breeds that “could have contributed to the genetic makeup of the ancestors indicated by the mixed breed icon.” Some of them are to be expected and others are not. So, really, after the test we’re at the same place, identity-wise, that we were before, and that’s just fine by us. This just allows us to rely more heavily on the idea that all dogs are individuals, and regardless of what breed they are genetically, or what category of dog they fit based on appearance, we still have to understand each of them for their own unique traits. I had a lot of fun doing the DNA test, and Lucy certainly had a hoot telling you all about it, too. But more importantly, I’m happy to have such an amazing dog that with whom I have formed an irreplaceable bond. “Originally from Animal Farm Foundation, Pugsley returned after his owner passed away and his family could no longer take care of him. Now at 11 years old, Pugsley has been around the block. He has met lots of people and his family reported that he is great with small children. Pugsley is quite the gentleman and will give you a hardy handshake when you meet him. About two weeks ago, Dad started chasing me around the house with a little, white plastic…brush thing! At first I thought he was trying to put doggie mascara on me, and I said, “Dad, my eyelashes are long enough! I don’t need mascara!” And then he stuck the thing in my mouth, which really confused me! Who puts mascara in their mouth? He twirled the little thing around a bit and it tickled the inside of my cheek – I didn’t like it very much, and once Dad was done, I ran as far away from him as I could. No more mascara in this pittie’s mouth, thank you very much! But then he came back to me – WITH ANOTHER LITTLE BRUSHY THING! SO MEAN! He stuck this one in my mouth, too, and twirled it around some more. Well. I was so not happy with him that I sat down on the other side of the room and ignored him all night long. But he said, “Now, Lucy, I want to know what breeds show up in your DNA. It’ll be fun!” I was just happy the whole ordeal was over, to be honest. Well, duh, Wisdom Panel people! Excuse me? I’m a WHAT? 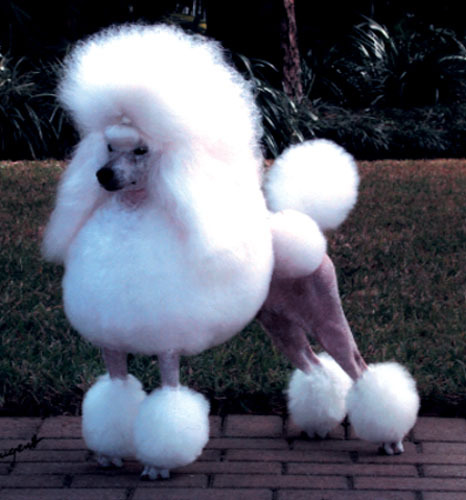 Does this mean I could be related to my poodle friend Tilly? Cool! Ok, so Dad was right – this was fun. But I never want a mascara stick in my mouth ever again! Have a great weekend everyone! Those are two pretty scary words, huh? Separation anxiety can be one of the toughest issues to handle with a doggie companion. It can result in destruction of crates, furniture and more and cause some serious harm. 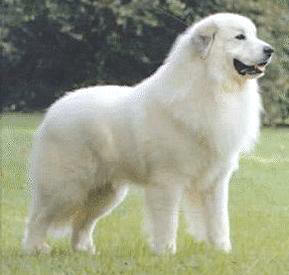 Not only that, but it requires a lot of patience, understanding and dedication on the part of the owner. But what happens when it’s not the dog who’s experiencing the separation anxiety, but the human? You see, I have a vacation coming up; a trip that’s going to be lots of fun and honestly, very much needed. Some time away might be exactly what this aching body needs. But what does one do when he’s stressed out about leaving his beloved dog at home? The stars just don’t seem to be aligning for pet care for this trip. Our regular dogsitter isn’t available. Guess what? Neither is the back up dogsitter. What’s worse? The only doggie daycare facility I trust: fully booked. I mean, as if I already didn’t have trust issues with other people taking care of my sweet, little Lucy: remember the story of that little car accident that happened while I was out of town? Fortunately for me, I’ve still got a few weeks to work this out, but what’s a guy to do? How do you handle your separation issues when you have to be far away from your pet? Even if your pet has reliable care, do you still stress out the way I do, and want to call home every five minutes to check in? Am I just being a little overbearing absolutely insane? Help, please! How do you train a human not to have separation anxiety?! We always have some Nature’s Miracle Odor Remover around the house (for those foster dogs who haven’t quite figured out the house training yet), but in this BarkBox, we got their (seemingly new) Freshening Spray. If you’re anywhere as busy as I am on a day-to-day basis, this stuff is going to be very useful! Already opened and sprayed, Lucy smells delightful (not that she smells bad regularly), but it is a nice scent to have her wear as opposed to the “I-haven’t-had-a-bath-in-two-months” smell. 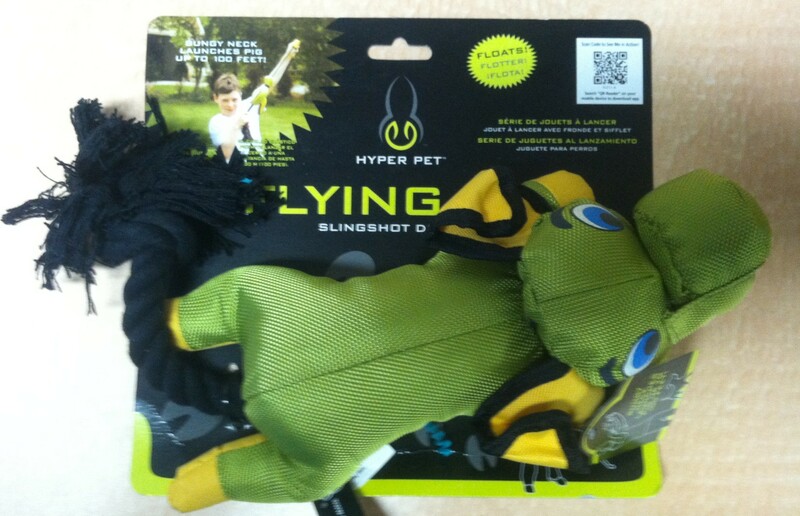 Then, we took out this awesome looking toy from Hyper Pet called the Flying Pig Slingshot Toy! According to the instructions, you launch the toy by putting one thumb into the snout and pull back on the body. It then shoots off into the distance and your dog chases after it. 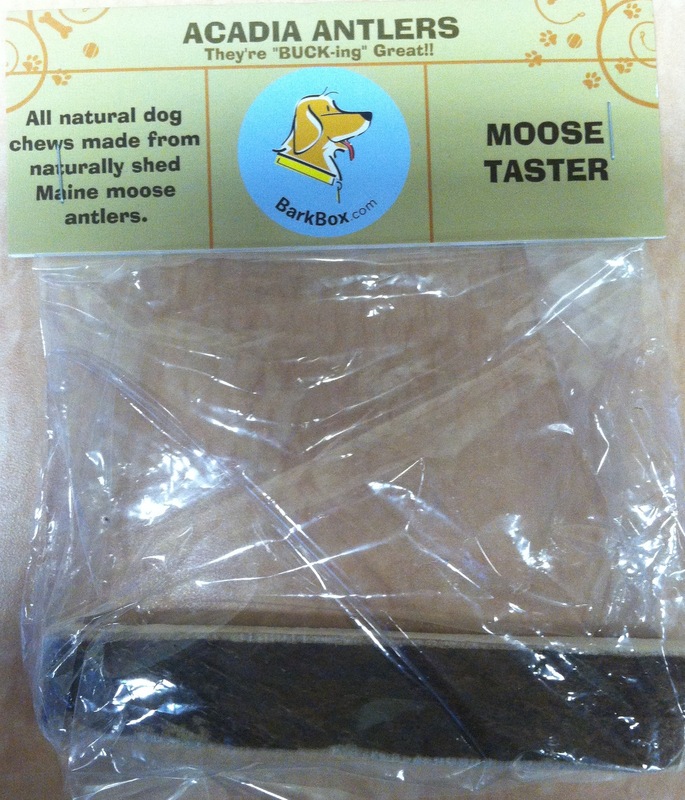 For dogs that love to fetch, this sounds like the perfect toy! Then, oh boy, we got one of Lucy’s favorite things! A moose antler from Acadia Antlers! I think there’s enough said on this one – Lucy can’t wait to get her paws on this! 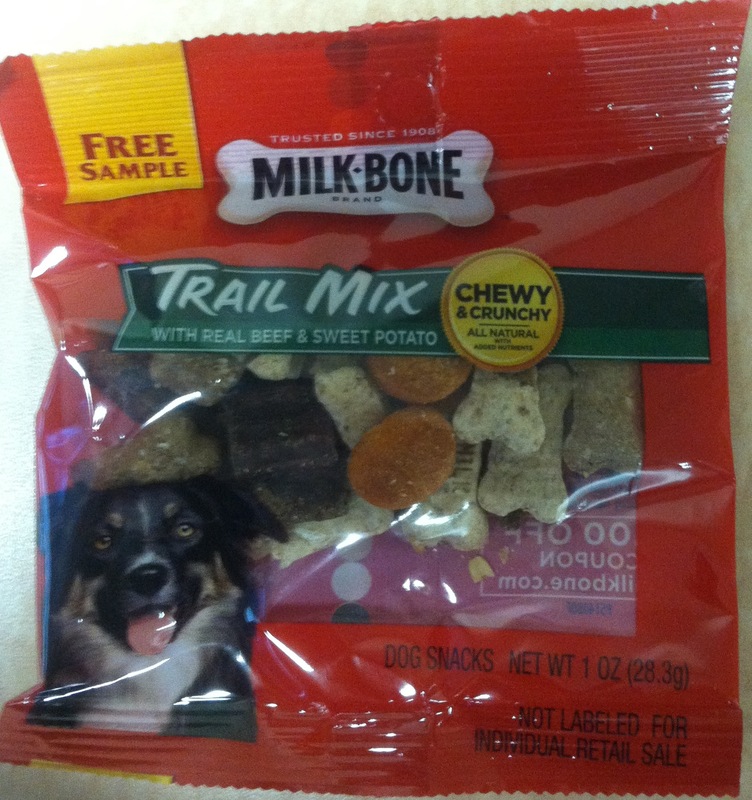 Next, we got a sample sized pack of Milk-Bone’s Trail Mix treats. I use Milk-Bone treats all the time with my dogs – I’ve found it’s the perfect treat to use for crate training. It’s big enough that I can hold it through the side or top of the crate, and the dog can still get it from inside, they love the taste, and it doesn’t have anything harmful in it that will upset their stomachs. So, we’ll try out these treats and see how it goes! 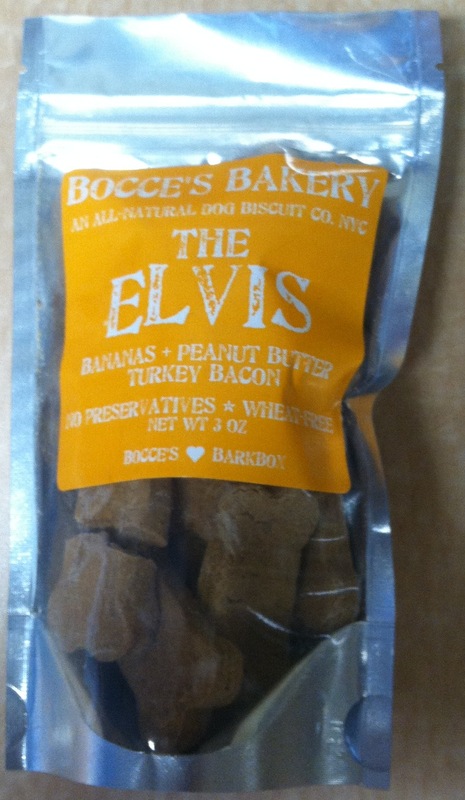 And lastly, a special kind of treat: The Elvis from Bocce’s Bakery here in New York City! 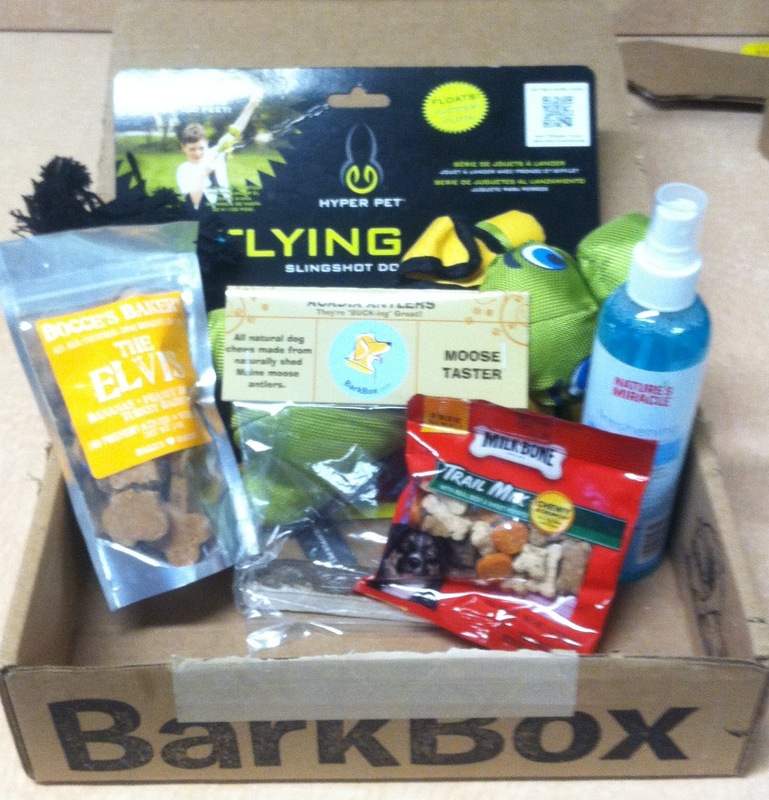 So that’s what’s in our BarkBox this month! Don’t forget to sign up here. 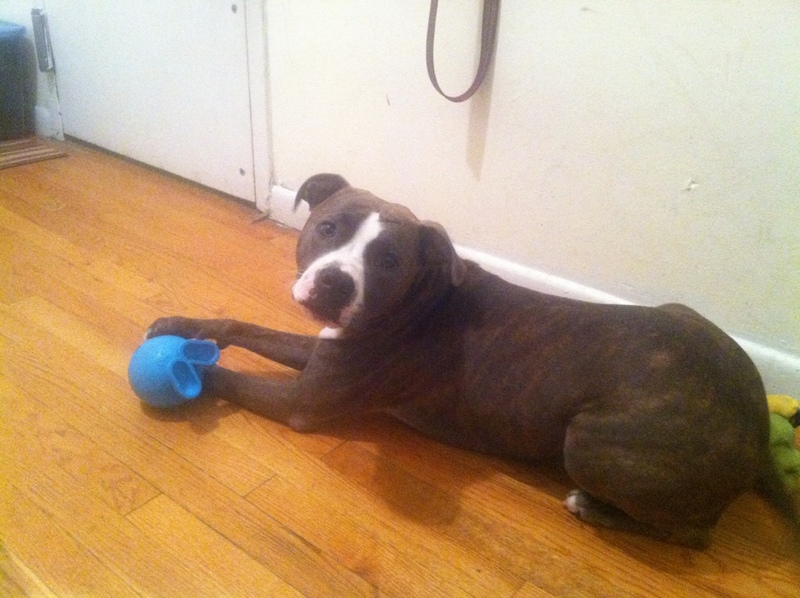 “NuNu is a gorgeous chocolate brown American Pit Bull Terrier. 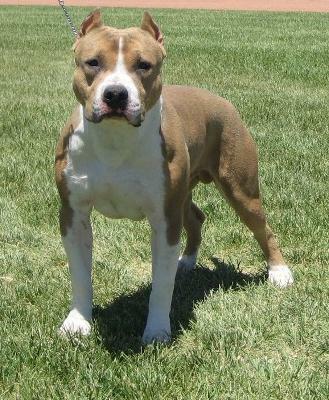 She is a perfect ambassador for her breed. 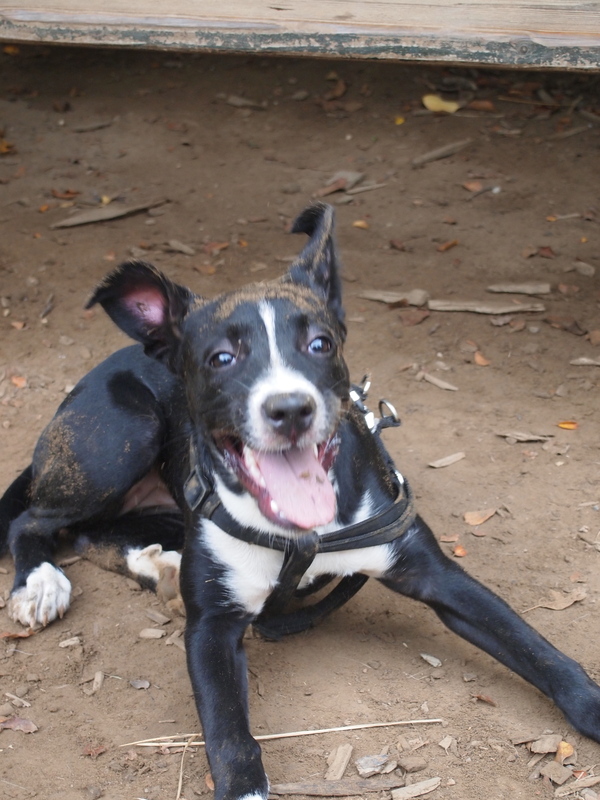 NuNu is very friendly to both people and other dogs. Check out this video New Rochelle Humane Society posted on their Facebook Page of Nunu playing. If you would like to meet Nunu, please visit the shelter. They are open seven days a week from 10am to 4pm and Thursdays from 2pm to 8pm!